There are various ways that you can train apple trees and one of the simplest is to grow them as step-overs. These low growing trees have gained popularity over recent years, but they have been around for a long time and were planted in Victorian kitchen gardens as edging around fruit and vegetable beds. A step-over tree is basically two horizontal branches growing from a short trunk and normally they are trained to be between 30-45cm (12-18in) tall. They get their name because you can step over them! As well is in a fruit garden, step-overs can be planted in other parts of the garden as a low hedge, with the bonus of producing a crop of apples. 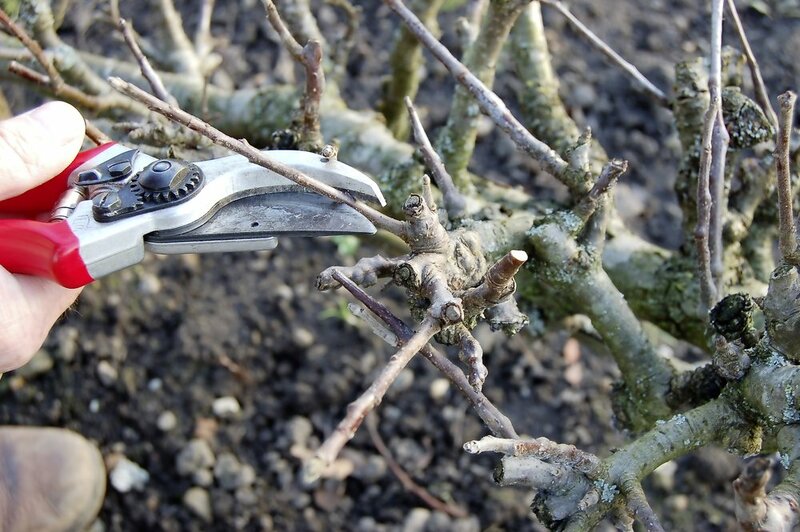 They are also very simple to maintain, with most of the pruning being done in late summer, by cutting back the long new shoots to produce short fruiting spurs. Any thin, weak shoots that have grown since the trees were pruned late last summer can be cut hard back. On younger trees check the main horizonal branches are firmly tied to a wire or cane to keep them straight and level. On established trees thin out or shorten some of the large clusters of spurs, to improve air circulation around the fruit in summer. To prevent established branches from bending with the weight of fruit, use short wooden props to give support to the branches. In the winter when the foliage has dropped, established trees should be checked over and any final pruning done to remove thin, wispy shoots. On older trees the clumps of fruiting spurs can become crowded, so you may need to thin them out to allow room for the fruits to develop. It’s also important to make sure that the horizontal branches are well supported so that they can carry the weight of apples in summer.